With Guardians Of The Galaxy Vol. 2 hitting theaters in less than six months, Marvel is giving the Guardians a big comic-book push by launching an assortment of new series. This week saw the release of the first issues of Chip Zdarsky and Kris Anka’s Star-Lord and the long-awaited Gamora by Nicole Perlman, co-writer of the first Guardians Of The Galaxy film, and Marco Checcheto. Both of these promising debuts suggest that the cosmic team is in good creative hands for the foreseeable future. Next week’s Rocket Raccoon shares a lot in common with Star-Lord, following the titular character as he acclimates to life on Earth following the destruction of the Guardians’ spaceship in Civil War II. 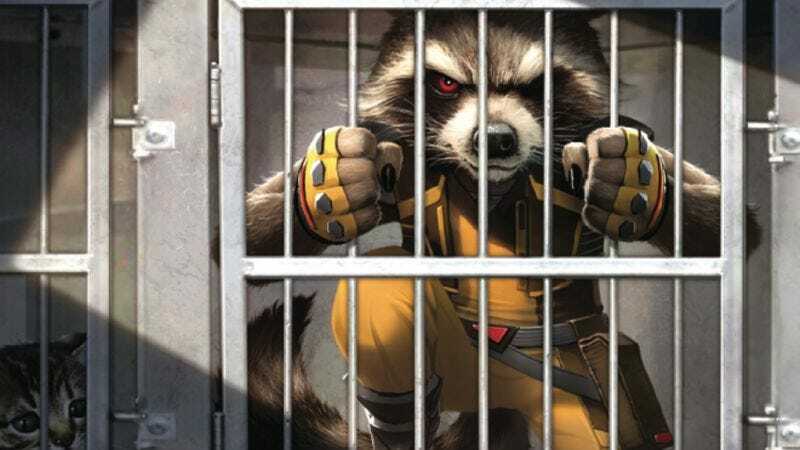 Rocket isn’t happy about his current circumstances, and writer Matthew Rosenberg shows a strong handle on Rocket’s voice in this preview of next week’s Rocket Raccoon #1, capturing the cantankerous, standoffish attitude that becomes especially pronounced when Rocket is in an environment that he feels out of place in. That environment is brimming with energy thanks to the artwork from Jorge Coelho and colorist Antonio Fabela, and the opening splash page of Rocket standing before Times Square mines humor from the contrast of the setting’s spectacular atmosphere with Rocket’s impression of what he sees. This preview is light on the weapons-based violence that Rocket is known for, but Coelho’s previous work on books like John Flood, Polarity, and Zero have proven him to be an exceptional action storyteller. When Rocket’s disdain for Earth turns into aggression, this furry little guy is going to turn into quite the formidable fighter.